Dale Yu: Review of Memoarrr! Memoarrr! is a card based memory game that seems quite simple when you first read the rules, but proves to be more complex once you actually play it. In the game, there are 25 location cards – one of each possible combination of 5 animal figures and 5 colored backgrounds. The cards are dealt out in a 5×5 array on the table and then the center card is discarded and put back in the box unseen. A deck of seven treasure cards (ranging from 1 to 4 rubies on them) are shuffled and placed in a stack in this center space. 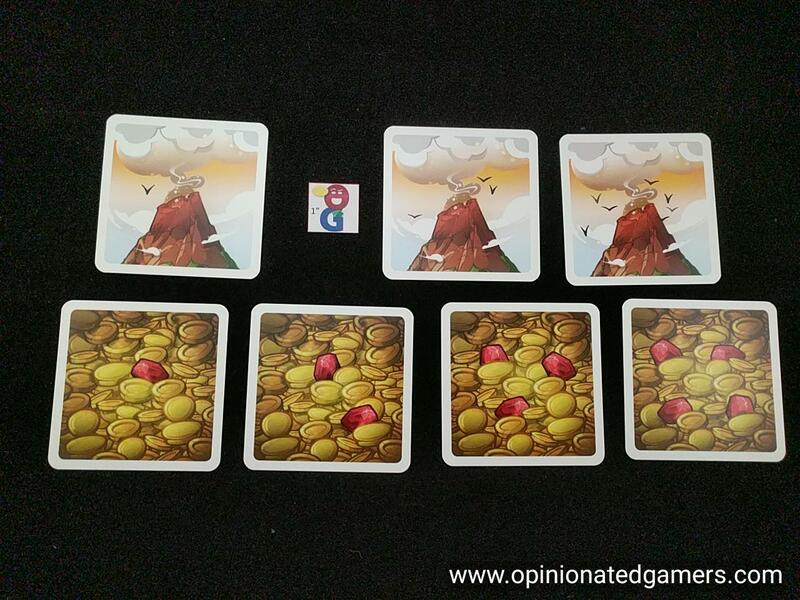 Volcano cards – one less than the number of players – are then put on top of the treasure stack. Before the game starts, each player gets to look at the middle three cards in the row are cards in front of him. These cards are then put back in their original places once they have been examined. A start player is chosen and then the game begins. The first player chooses any card in the array and flips it over. In the basic game – this is all that happens. The next player now takes their turn. In the advanced game (which I would definitely recommend playing), you first take the special ability of the animal that you just revealed. 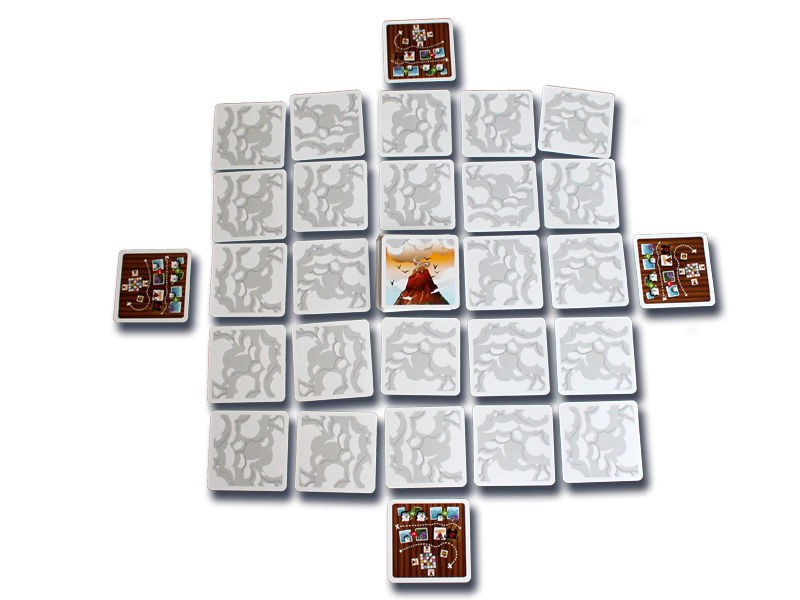 Once the animal action is completed, the next player in turn order goes (Note that this could be the same player if a crab was just revealed). 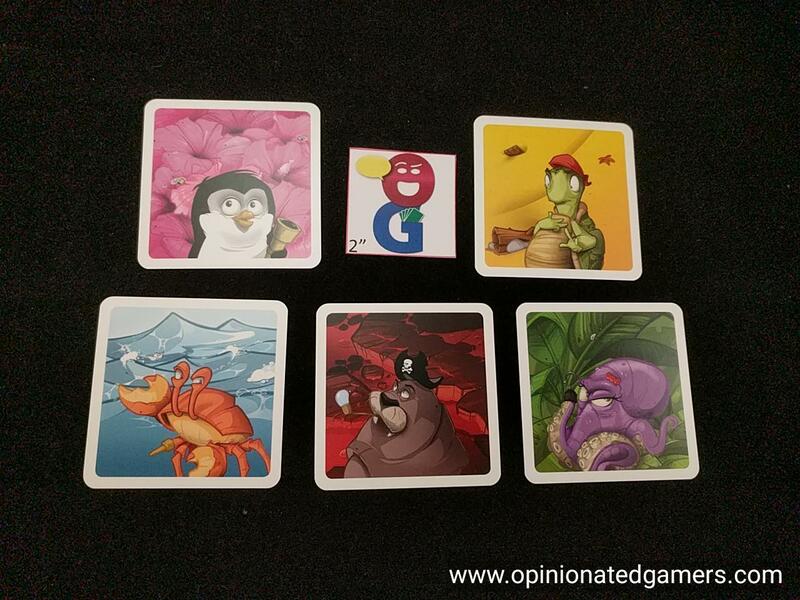 That player chooses an unrevealed card from the table with the goal being to choose a card which matches either the animal or the color background of the most recently revealed card. You must select a facedown card – even if you know there isn’t a match on the table. If all the location cards are chosen, then you must take a face down volcano card. If you are unable to match, you must take a volcano card from the center stack and place it face up in front of you. You are now out for the rest of the round. If you are able to match, then you perform the action of the animal that you revealed and the game goes on. The round continues until all players but one have a volcano in front of them. At that point, the last player standing takes the top card from the central deck – which will be a treasure card – and the current round ends. All exposed cards are flipped over and kept in the same location where they ended the previous round. The player who drew the volcano card with the most birds on it will be the start player of the next round. The volcano cards are then shuffled and placed back on top of the stack of treasure cards. If you are at the end of the seventh round, the game ends. The player with the most rubies on their treasure cards wins. If there is a tie, it is broken in favor of the player with more treasure cards. As I said from the start, I was frankly underwhelmed by the game when I first read the rules. I thought to myself – this is just another memory game. And, when we played our first game, using the beginner rules as suggested by the rulebook, it was kinda meh. By the end of the game, our group of four was able to remember the positions of the 24 cards, and the game lost much of its excitement. As the location cards aren’t shuffled between rounds, I think this can be a common occurrence. However, once you add in the animal actions, the game gets a lot harder to memorize! Now, you have a bit more motivation to choose (or avoid) certain cards. Getting a crab early on in a round usually doesn’t pose much of a problem, but you could end up putting yourself out of a round by having to take an additional turn when it’s harder to remember where all the cards are! The only action card which moves things around is the Octopus – but over a few rounds – it becomes really hard to remember which cards have been moved! In our games, we seem to choose the octopi as quickly as we can in order to move around the cards in front of our opponents… We also try to use the Walrus to either prevent opponents from choosing particular cards that we know the identities of – or sometimes use a bit of double think and try to convince your opponent that the chosen card is something that it is not! Thus far, I have found that I enjoy the game with all player counts, but I think that I actually prefer this with two. You get more turns per round, and there isn’t an opponent binding issue. Though the game is about memory, the differing (and unknown) values of the treasure cards mean that you never quite know how many points a player has. Suffice it to say that you’ll need to win a couple of rounds to compete for the win, but you simply won’t know until you reveal at the end. For a 15 minute filler, this one is interesting enough, and possibly the “best” memory game that I have. We have had plenty of laughs watching each other struggle to remember which cards are in which locations, and the short playing time means that it never overstays its welcome. For me, a surprisingly enjoyable game from SPIEL 2017. Chris Wray (10 Plays): I’m really enjoying this, which is unexpected because I also don’t like memory games that much. I agree with Dale: this is probably the best memory game that I own. Not only have I enjoyed it, but many of my gaming friends have liked it too, and it has been a hit with my family. I wouldn’t be surprised if this got a SdJ nod: I don’t think it’s a top contender, but to me it has an outside chance. 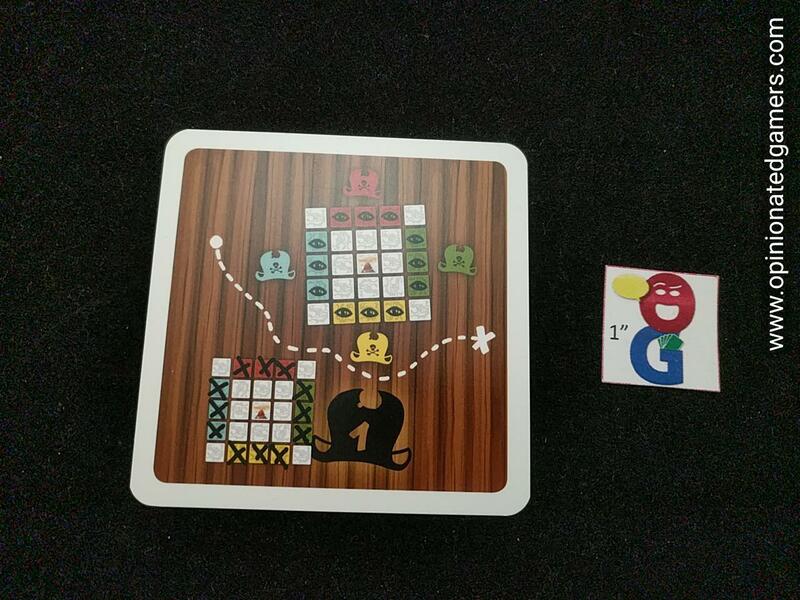 James Nathan (2 Plays): This was probably the most pure fun game I played at bggcon this last year. Just a joy to play. The strategy won’t bowl you over, but it’s a hoot. 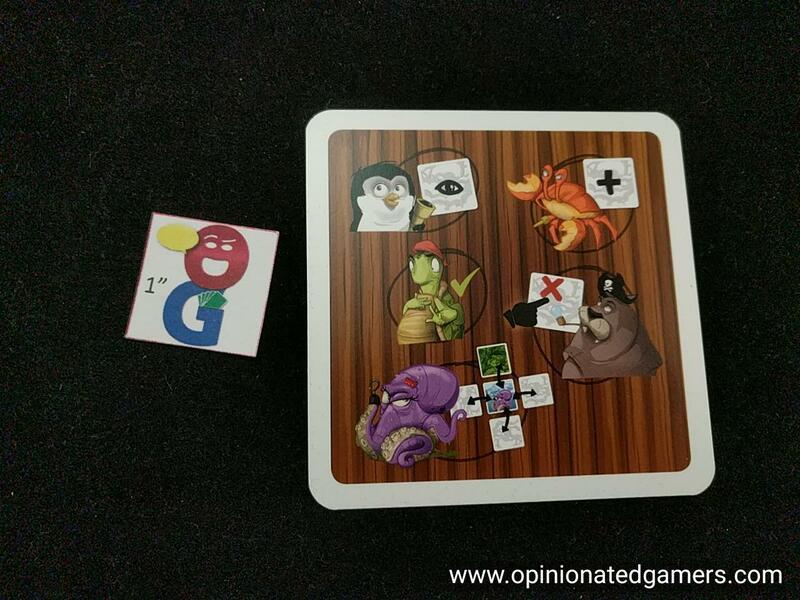 Jeff Allers (10+ Plays): I, too, was not that enthused about trying this, despite the fact that the publisher is a personal friend and the designer is a friend and colleague at my weekly game designer’s meetup. 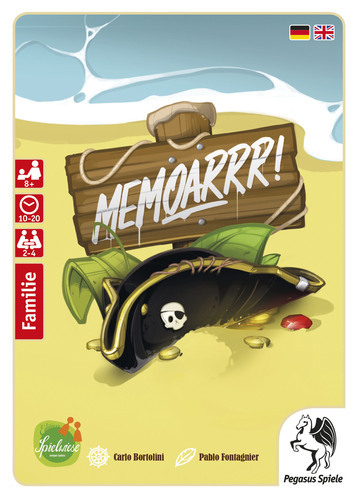 “Just another memory game…meh” was, quite honestly, my first thought. But because we meet regularly to play each other’s games, I thought I would finally give this a try, one-on-one against the designer. I am so glad I did, as I was pleasantly surprised by how original and fun it was. My favorite part is how a “chain” develops as players fall into following a pattern set by the previous player–and how you can suddenly and cleverly break the chain to throw the next player off. Finally, a memory game has come along with some strategy and player interaction! The animal powers add some spice, but I still enjoy teaching the base game, with it’s simple, elegant rules. Everyone I have introduced the game to has enjoyed it, from adult gaming groups to school children, and I have enjoyed giving it as a gift to many of our friends as well. This could be Kinderspiel des Jahres material (German Children’s Game of the Year). In a bold and original move, Edition Spielwiese also commissioned renowned German graffiti artist Pablo Fontagnier to “spray” the gorgeous art for the game. I hope it won’t be his last foray into board game illustrations. 4 Responses to Dale Yu: Review of Memoarrr!